Includes acid pack for correct and simple activation! 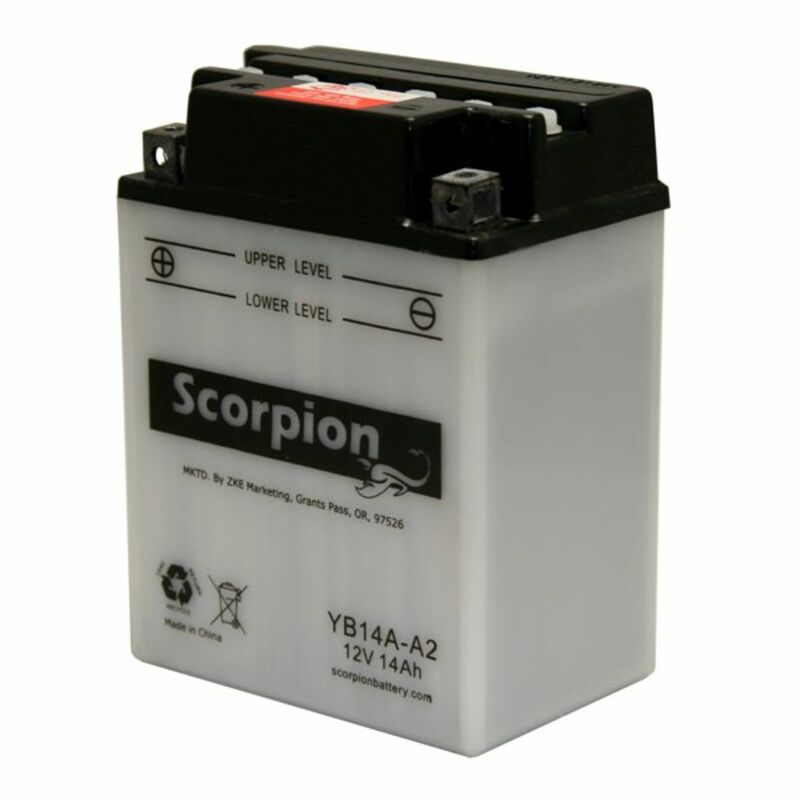 Scorpion High Performance wet cell is not an ordinary YB14A-A2 replacement battery but a specially designed rugged and powerful glass mat battery. 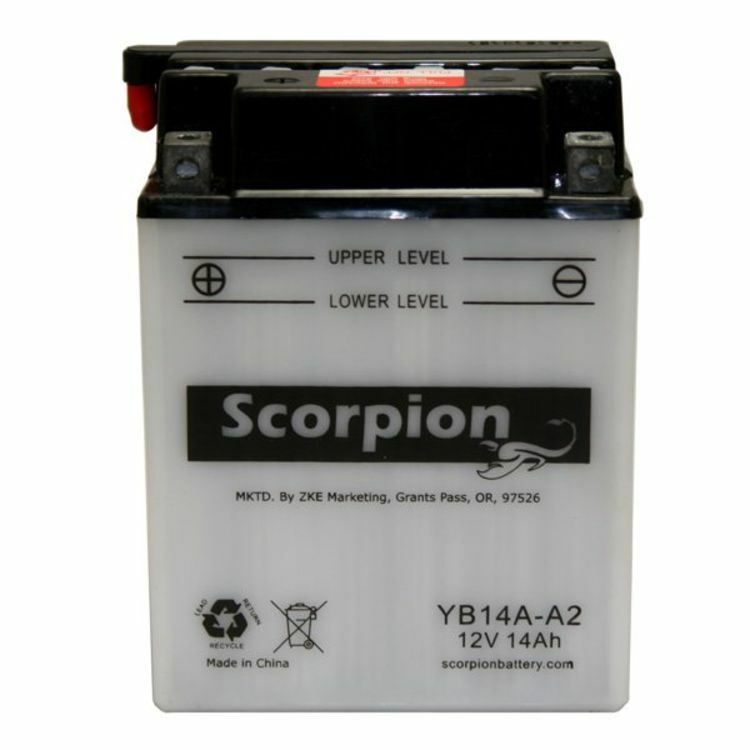 The Scorpion High Performance batteries typically offer true higher cranking amps and additional reserve capacity as compared to other replacements batteries. These batteries are shipped in specially designed packaging which includes the correct amount of electrolyte; end user must add electrolyte and activate battery. Offering vibration resistance and low internal discharge rate, you will achieve longer physical endurance and superior off-season storage potential. However, for long-term storage (30 days or more of non-use), we recommend a maintenance charger. 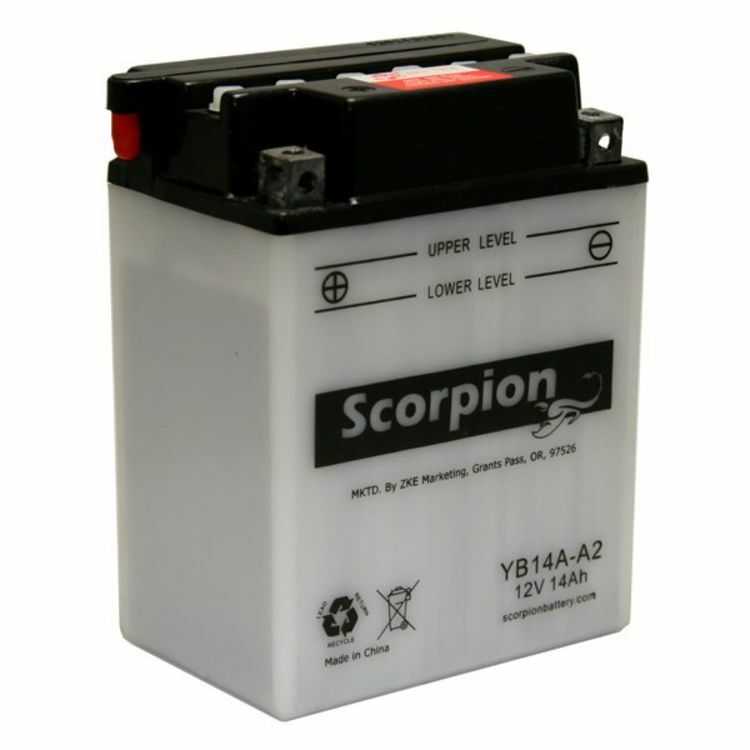 Scorpion recognizes that batteries are made of lead, not gold. With that in mind, Scorpion has struck a fine balance between a high quality product and a decent price. You will be impressed with the YB14A-A2 12 Volt High Performance w/acid pack battery! All Scorpion batteries meet or exceed the specs called for by your powersports manufacturer! Rated 5.00/5 Stars from 2 customer reviews. Do you own the sYB14A-A2? Please, tell us what you think about it. It helps us provide you with better products. Please note that it may take up to 72 hours for your review to appear. Pros: This battery arrived one time as expected and we charged it up as it said to do in directions. It took two times to charge it up, don't know if it was our charger or what but after that our 4 wheeler started right up and has each time since. I feel like we made a good purchase. Cons: I can't think of any cons at this time, just purchased the battery recently. When do I add more liquid?